Luby's Shredded Carrot Salad - make this salad at home with our recipe. Make this salad at home with our recipe. Luby’s Shredded Carrot Salad is a wonderful salad to make any time of the year. You can always find fresh carrots at the store. Combining carrots, pineapple, and raisins makes for a delightful salad that keeps fresh in your refrigerator, so you can make it ahead of time. 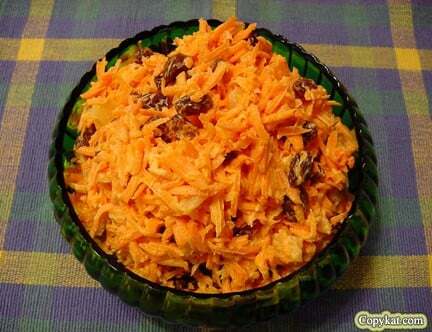 You can make Luby's Carrot Raisin Salad with our recipe. Combine carrots, pineapple, mayonnaise , raisins, and powdered sugar; mix well. Chill until ready to serve. I used to eat this ALL the time at Luby’s, but I don’t care for raisins so I picked them out. Do you think cranberries, that are packaged like raisin, would be an ok substitute for the raisins? I made this last Thanksgiving and will make it again. It’s very delicious. I add a little extra mayo because I like it creamier. Thanks for the post. Regular mayo or miracle whip? I would use regular mayonnaise. I have been looking for a carrot raisin pineapple salad like Hometown Buffet makes but can’t seem to find one.I don’t believe it is mayonnaise based.